Built on traditional values whilst maintaining an open mind to new technologies, looking for the best solutions for our clients. A company full of engineers who enjoy what they do and take pride in what they deliver. We are a company steeped in our history and ethos. 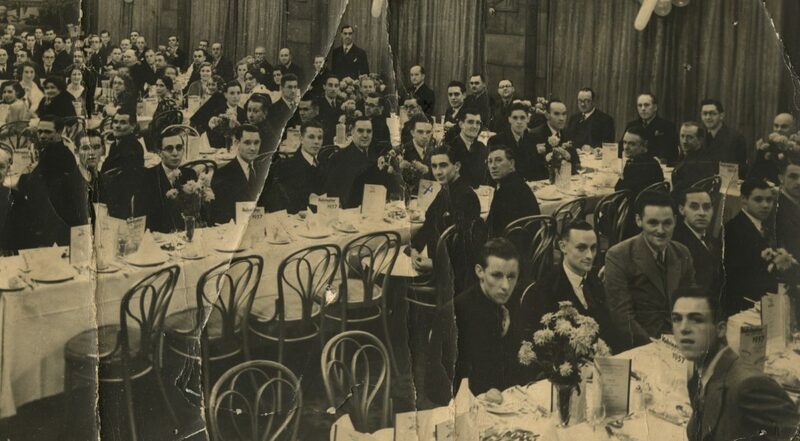 Our traditional values have served us well for nearly a century with customers coming back to us time and time again. Starting life as E&O Walker Refrigeration in 1926, we have been at the forefront of technological development within the industry ever since. Indeed, in the 1980s we changed our name to Temperature Control to reflect the growing significance of the air conditioning market. 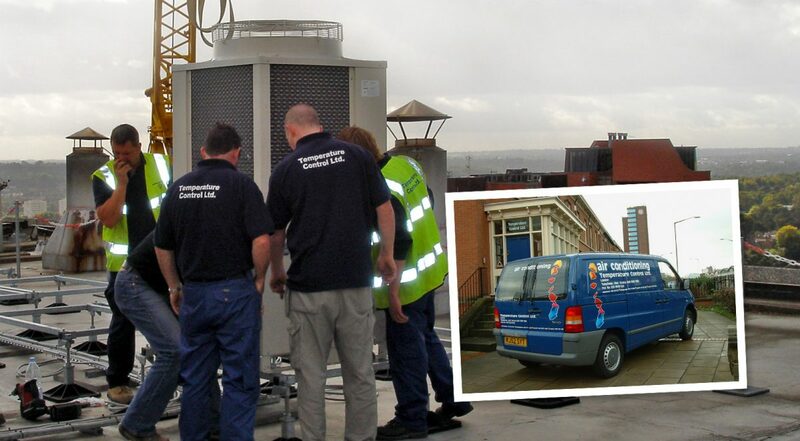 Working closely with leading air conditioning manufacturers across the world, the key to our success is our constant focus on quality, combining our development and innovation with traditional values and customer service. Today we have four offices across the UK giving us a footprint across the entire country, and have grown to become one of the largest specialist comfort cooling and heating contractors in the country. To reduce the energy use in the built environment without compromising comfort and service. To combine the latest technological advancements with traditional values in customer care and quality, through delivery of comfort cooling and heating to all areas where we work, socialise and live. We always strive to deliver the best value in terms of comfort, energy use and satisfaction. Customer satisfaction – We always aim to provide the best level of service we can. This not only underpins the long term growth of our own company, but helps our clients grow and succeed. A safe workplace – A culture of safety runs throughout our business. This doesn’t just apply to our own employees, but also to the specialist supply chain partners we employ. We enjoy our work because we know we are safe. Pride in our engineers – Pride is developed through being able to create and deliver a high-quality product that benefits everyone. Ongoing improvement – We must be agile and responsive to change. We analyse key trends within the industry and invest heavily in training to ensure we always provide the right advice to clients. When you select a suitable contractor you put your trust in them to deliver a project. But how would you trust us to deliver? Well, consider the trust we have built up with some of the largest names in the telecoms, hotel, banking and construction industries. And consider the fact that all our key supply chain partners are vetted and checked to ensure they meet our high standards. Ultimately a successful project is built on selecting the right partners. Partners you can trust to deliver. In an age when business relationships can seem increasingly impersonal, we continue to put great store by the personal touch. Developing and maintaining personal relationships remains absolutely key. You cannot buy such a relationship online. That’s precisely why we ensure there is always one key point of contact throughout all the stages of a project and beyond. This contact works closely with the client to ensure at all times that the project is running as smoothly as possible – and will always be on hand to deal with the inevitable challenges that projects can throw up. We don’t hide, we take responsibility and do everything we can to assist you, the customer. A high level of quality is the cornerstone to a long-lasting installation and the key to maintaining energy efficiency. That’s why we invest in our installation teams to make them some of the best in the industry. Through training and the use of the latest tools and techniques, we can ensure we deliver the best possible results time and again. Our commitment to be on hand at all stages of the life of a piece of equipment means we don’t simply stop working for you at the installation stage. We want our relationship to last the lifetime of the equipment. That’s why we do the job right first time. That way we maintain both our reputation and yours. It comes down to traditional values of customer care, of attention to detail, and of creating a partnership that works. When you select a suitable contractor, you put your trust in them to deliver a project. That’s why we won’t work with any new suppliers until we have checked and made sure that they meet our standards. Through building up such trust over many years we work today with some of the largest companies in the UK across a range of sectors including the telecoms, hotel, banking and construction industries. We are proud of our heritage and values that have been built on the same standards for over 90 years. Strong customer value, safe working practices and installations that are built to last. 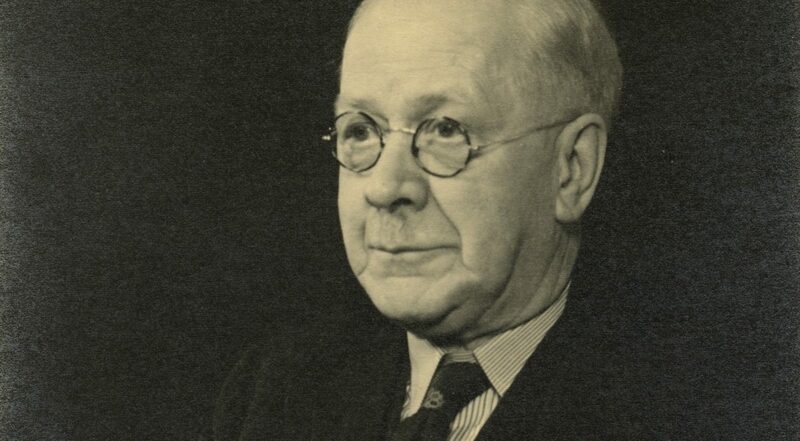 The company was founded by Mr E O Walker in 1899. With the introduction of electricity at the turn of the century, E O Walker & Co Ltd were on hand to support this new technology. 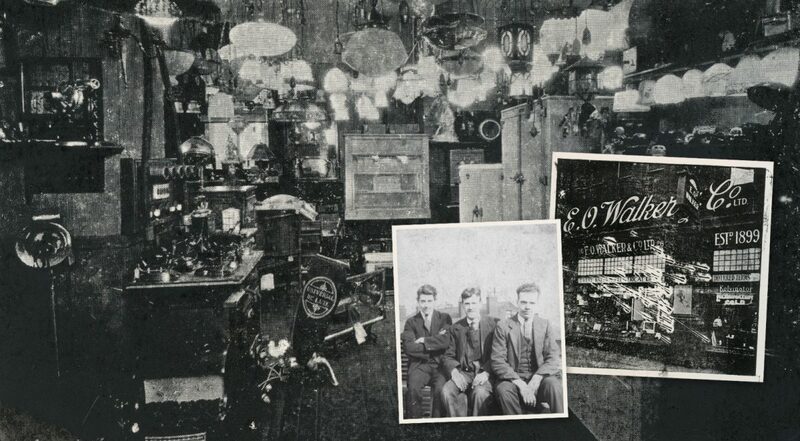 By 1926 a specialist electrical shop was opened in Cannon St, Manchester to serve the growing trend in electric lighting. This expertise also found use for specialist theatre lighting and support to the growing film industry. By the 1930’s E O Walker & Co Ltd had expanded into all types of electrical services, including the growing trend in refrigeration. As one of the first UK companies to obtain the franchise for the American Kelvinator refrigerator brand (as sponsors in the picture), the foundations of the company were developing. 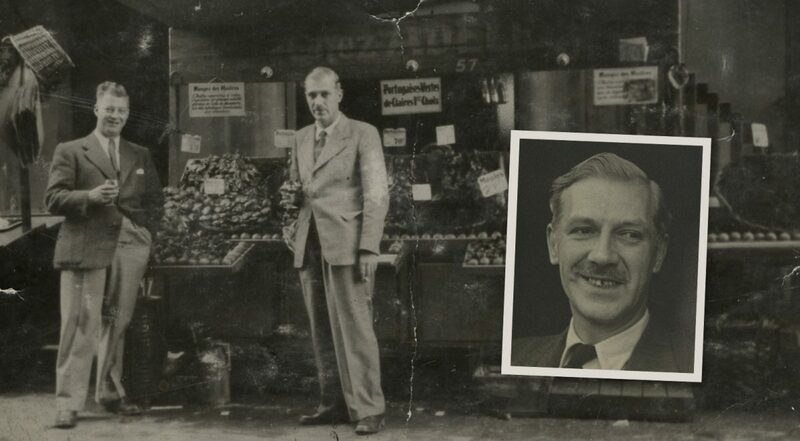 1942 oversaw the change in ownership with Mr H P Walker taking over the business from his father. The company maintained the Cannon St store and the electrical goods offered increased over this period into all types of domestic white goods. This coincided with the boom years after the second world war. 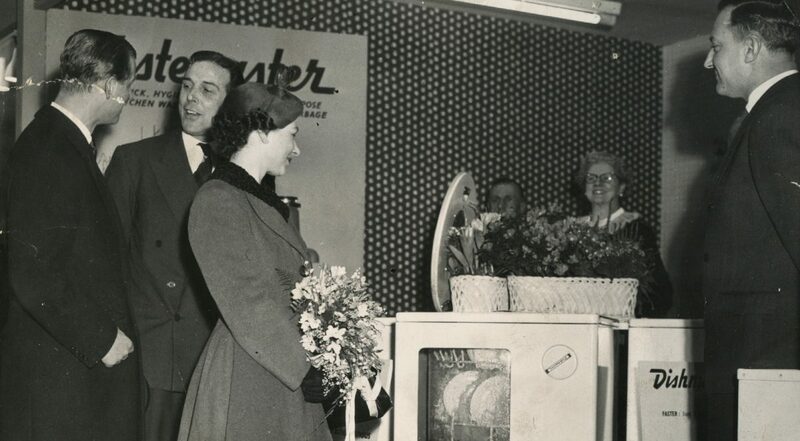 Even the Queen enjoyed a visit to one of the exhibitions the company held offering the best British and American home appliances. 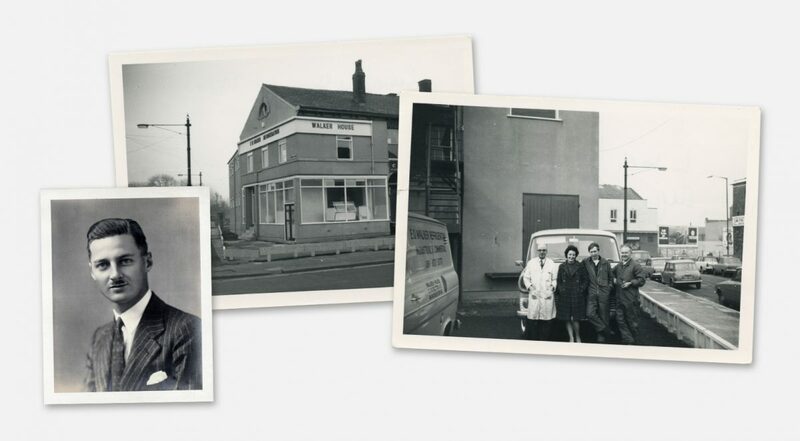 The early 1960’s brought in a new owner in Mr W Latta, who ran the business as E O Walker Refrigeration Ltd to reflect the change into commercial refrigeration. The business then moved from Cannon St, to the new premises at Walker House, Old Trafford where it remains now. 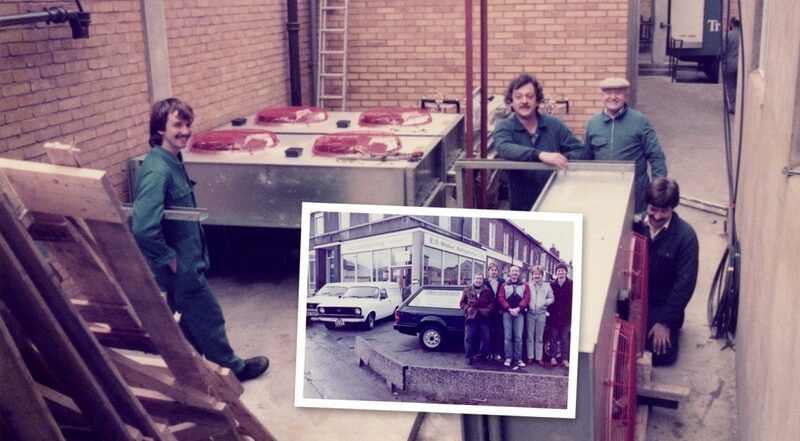 The 1970’s started to see E O Walker Refrigeration Ltd grow and prosper in this new direction. Mr Jeff Mellor joined the company during this period to offer bespoke products and eventually take over as Managing Director, kick starting the next stages of growth for the company. Through Jeff’s leadership, the company grew in the 1980’s and brought in specialist engineers to assist with this growth. 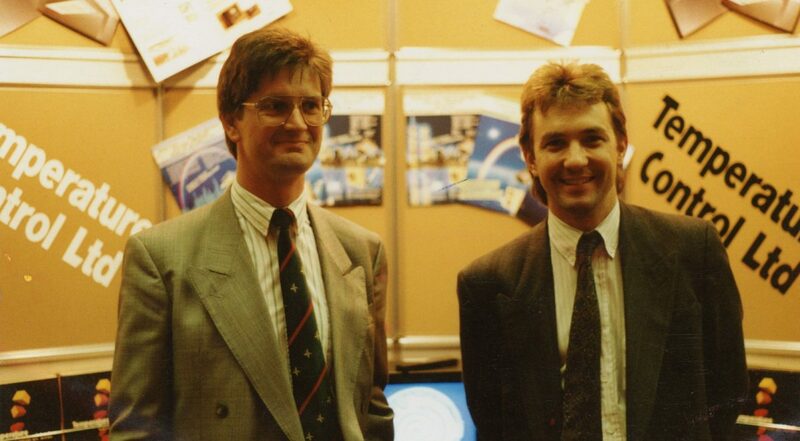 Including in this recruitment was a young engineer Steve Grundy who during this decade became Deputy Managing Director. This created a dynamic partnership to lead the growth in the early air conditioning market. 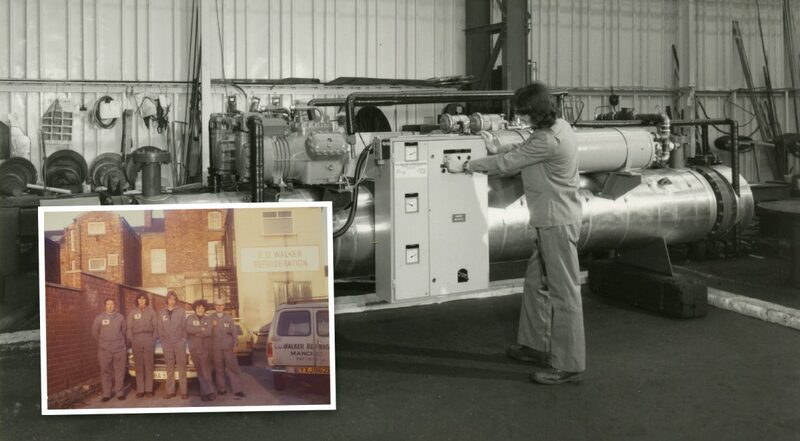 This growth in air conditioning, during the 1980’s, was reflected in the change of name from E O Walker Refrigeration to Temperature Control Ltd.
As the 1980’s saw the change from refrigeration to air conditioning, the 1990’s was where Temperature Control grew into one of the leading specialist installers in the UK. Through Jeff and Steve’s leadership, the company was an early adopter of what was the new VRV(F) air conditioning technology and throughout the 1990’s cemented Temperature Control’s reputation in quality and service. Key to this growth was the high quality of installations provided and the technical backup offered to clients. What are now common systems found in most applications, at the time VRV(F) was a highly specialise field and suited Temperature Control’s engineering expertise. The new century brought continued growth to Temperature Control. Jeff and Steve took overall control of the company and through growth in regional offices, throughout the UK , maintained its position in the market. One of the key growth areas during this period was working within the hotel industry, providing comfort cooling to more than 1,000 bedrooms a year, working closely with the leading air conditioning manufacturers. Other areas of growth included specialist IT / Data cooling, commercial office comfort cooling and the growth of our service and maintenance department. Coming into the new decade, Temperature Control gained an enviable reputation for setting standards in the industry. Working closely with manufacturers, key clients and bring their own engineering expertise, they were called on many times for more bespoke projects. 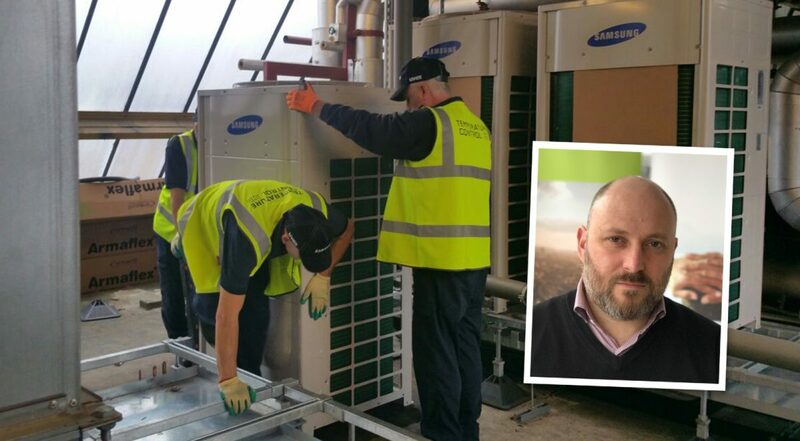 Whether this be the first trials of R22 replacement refrigerants, introducing CO2 heat pumps to the UK market, or installing comfort cooling into 450 bedrooms in a live hotel, all challenges were successfully over come. In 2016 also saw a change in ownership with Jeff Mellor and Steve Grundy retiring and Wayne Buckley taking over as Managing Director and owner.